This is yet another example of former adversaries- the Nepali Army and the Maoists- coming together to cover their dirty secrets (conflict-era crimes). 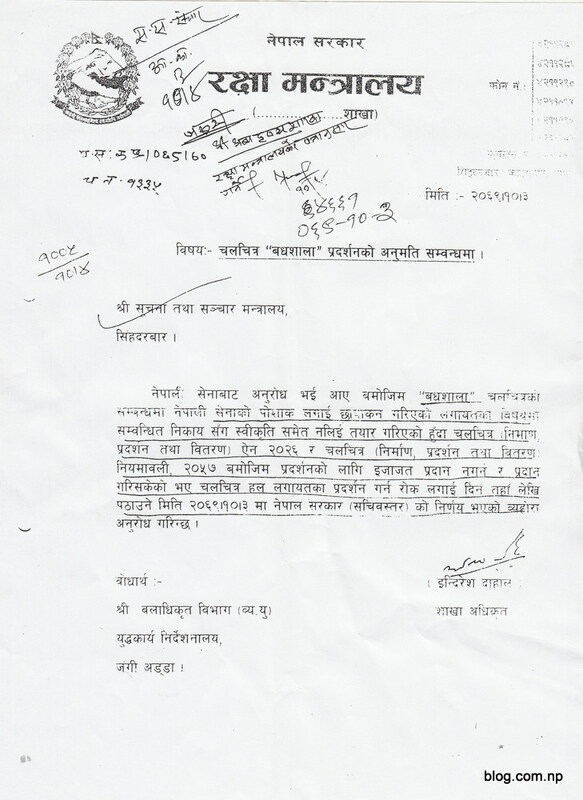 In a deplorable move, the Ministry of Defense, [currently led by Prime Minister Baburam Bhattarai], has requested a ban on Nepali movie Badhshala, citing a rarely invoked rule. Apparently, the filmmaker should have taken permission to use Army regalia in the movie. But many Nepali movies have previously depicted characters in Army uniforms without any interference from the government. Hence the Defense Ministry’s reasoning falls flat at the outset. All previous movie bans were conducted by censor board (for example, the movie ATM that was banned for vulgarity). This is the first time that the Defense Ministry has gotten involved in preventing a movie’s screening. Populist Prime Minister Dr Baburam Bhattarai has now tried to lured media fraternity by offering, what media report suggests, ‘unnatural facilities’. If you can’t beat them, join them. Or, bribe them. If it turns out to be true, the Baburam Bhattarai-led government’s attempt to appease the media sector only exposes the real character of an ultra-leftist government. It will be a kind of bribe but with completing legal formalities.